Violinist Emma Purslow was born in the Peak District, and is now based in London following her studies as a scholar at the Royal College of Music with Daniel Rowland and Sasha Rohzdestvensky. 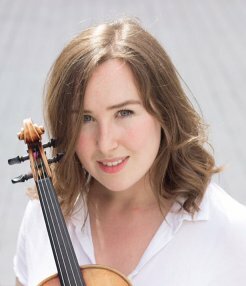 She is a passionate chamber musician who has performed extensively throughout the UK and abroad, including performances at the Wigmore Hall, Royal Albert Hall, Kings Place, Royal Overseas League and the British Ambassadors Residence in Paris. She has also performed alongside notable musicians including the Brodsky Quartet, Trio Apache, members of the Navarra Quartet and Clio Gould. Emma also loves solo performance, and the last year has included recitals at the Elgar Rooms in the Royal Albert Hall, St James Piccadilly, Leeds International Concert Series, the Stift International Festival in Holland, and a performance of Prokofiev’s Violin Concerto No.2 with the Hereford Symphony Orchestra. She enjoys a freelance orchestral career performing regularly with orchestras including the City of Birmingham Symphony Orchestra and Bournemouth Symphony Orchestra, and also leads the Street Orchestra of London. Described by the Guardian as ”truly uplifting”€� this 40-piece ensemble aims to bring live orchestral performance to those who would ordinarily be unable to access it. Emma recently represented them as a guest speaker at the Association of British Orchestras Conference 2017. She plays on a Guastalla violin kindly borrowed from the Harrison Frank Foundation, and a Ceruti viola generously on loan from the Hepner Foundation, with thanks in particular to Regina Hepner. After studying at Chetham's School of Music for nine years, Eleanor Kornas read Music at the University of Cambridge, becoming a Senior Scholar and winning the Donald Wort Prize for academia. She also accompanied Trinity College Chapel Choir for three recordings of music by Leighton, Eenvalds and Howells, all nominated for Gramophone awards. Eleanor then worked as an Adami Award Junior Fellow at the Royal College of Music, a Staff Accompanist at Chetham's School of Music, and is currently a Piano Accompaniment Fellow at the Royal College of Music and a member of the London Philharmonic Orchestra’s Foyle Future Firsts Development Programme. From September 2018 she will begin working in a new position, as Head of Keyboard at Queen Margaret's School, York, whilst continuing to enjoy a busy musical life as a duo partner, soloist and chamber musician both nationally and internationally. Although based in London, Eleanor particularly enjoys returning to her home county of Derbyshire for performances, which have included appearing as a soloist with Derbyshire City and County Youth Orchestra and to work with the Derbyshire Singers and Derbyshire Sinfonia.